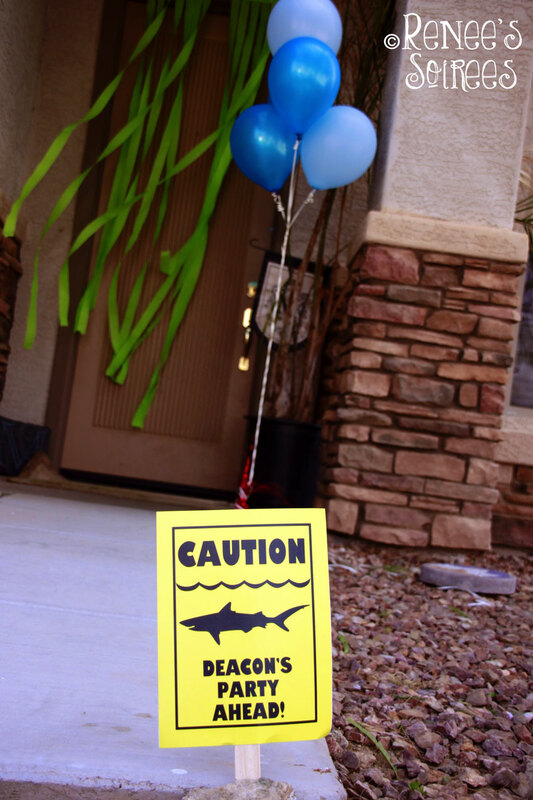 Guests were greeted with shark ‘warning’ signs that we mounted onto paint sticks. Easy peasy! 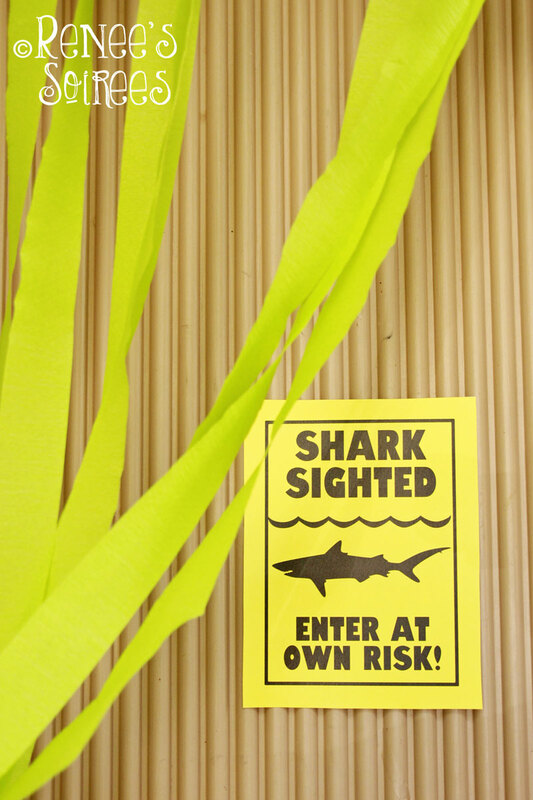 The signs are included with my Shark collection. 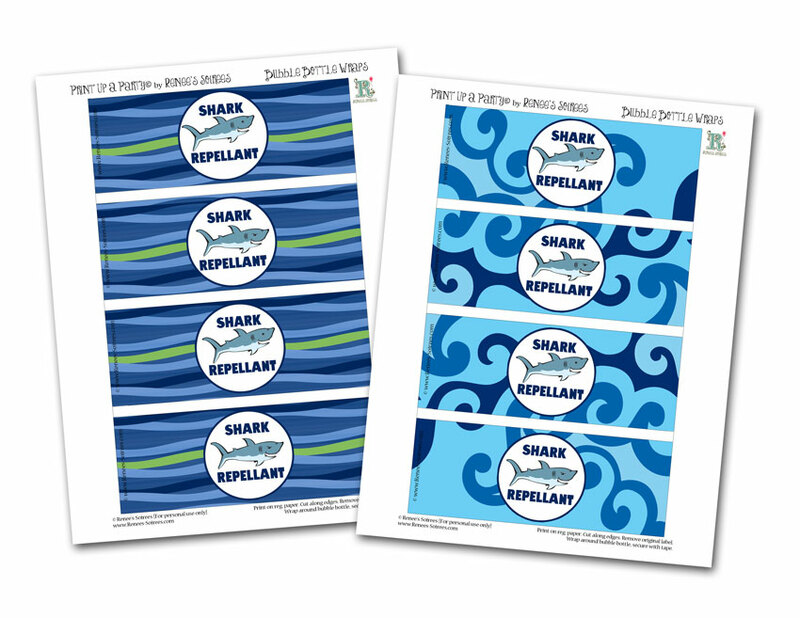 The Shark Collection comes in two different patterns… I call the left one ‘ripple’ and the right one ‘swirl’. 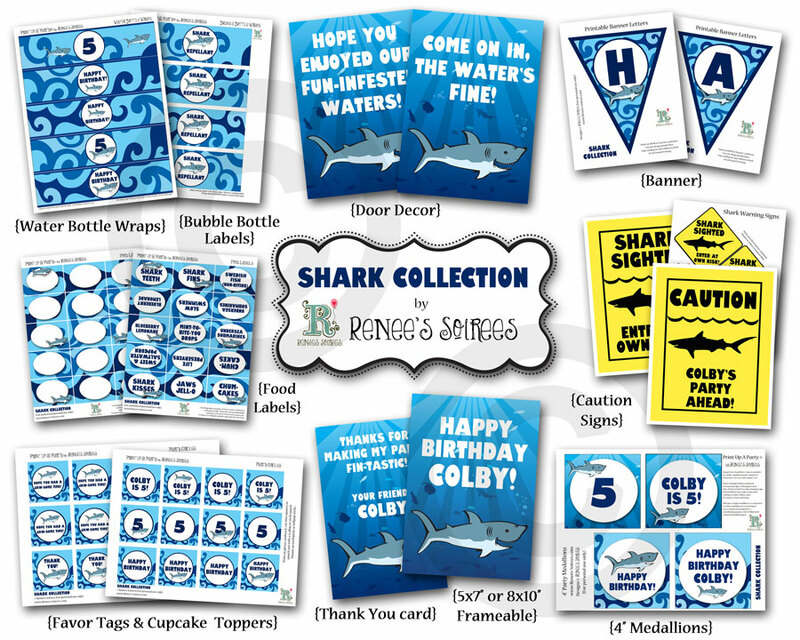 These are the bubble wrappers, included with the shark collection, or sold separately here. 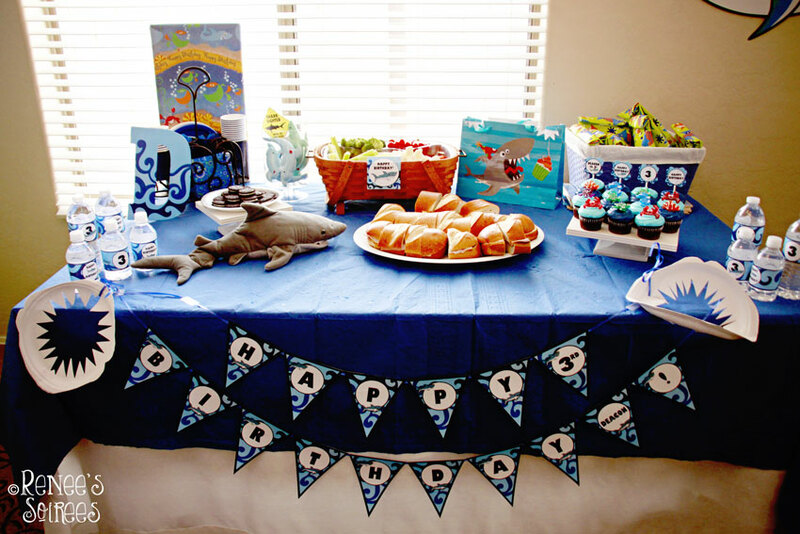 Here is the main table, done with the blue & green Ripple printables. And the second table, done with the Swirl pattern. 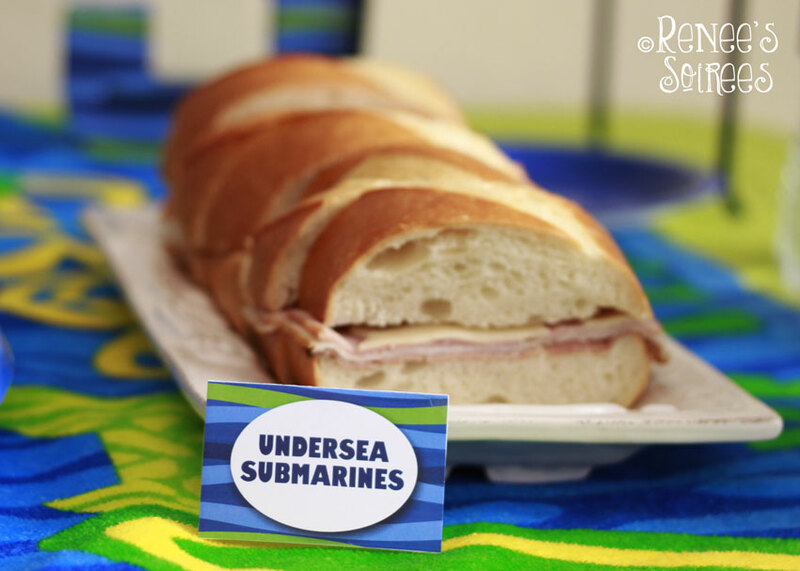 The ocean-themed foods were a lot of fun to think up and create. This watermelon shark was definitely the highlight of the table. And it was surprisingly easy to create! My sister Rochelle carved it in around 20 minutes. 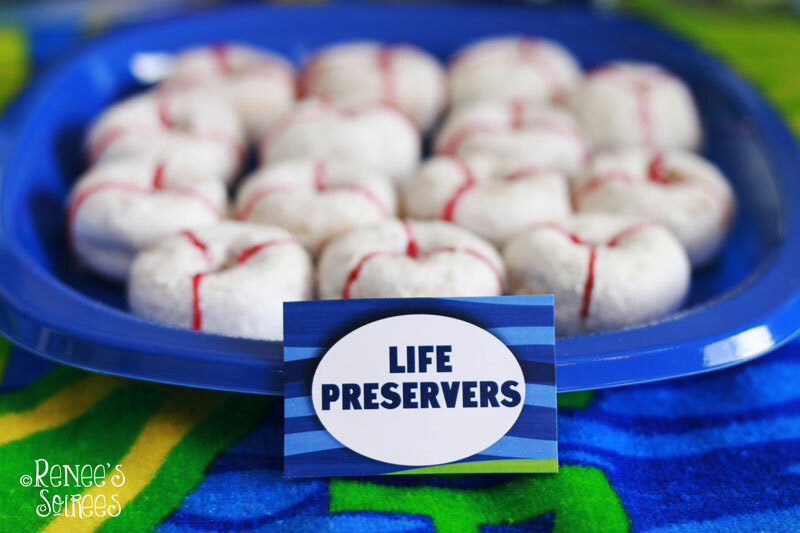 Here are the ‘life preservers’ (made with powdered mini donuts and decorated with a tube of red gel icing). I typed onto the food labels (included in the collection) in a paint/graphic program, but you could also just write onto them. 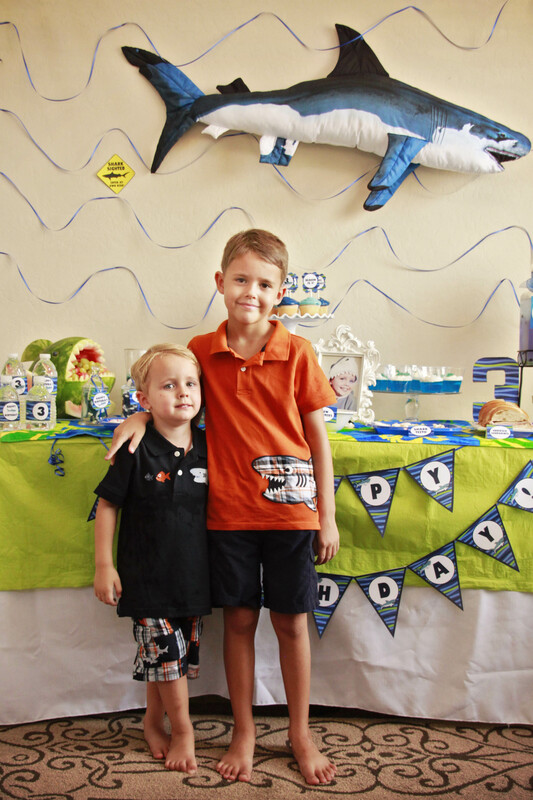 The birthday boy and his cousin loved the life preservers. 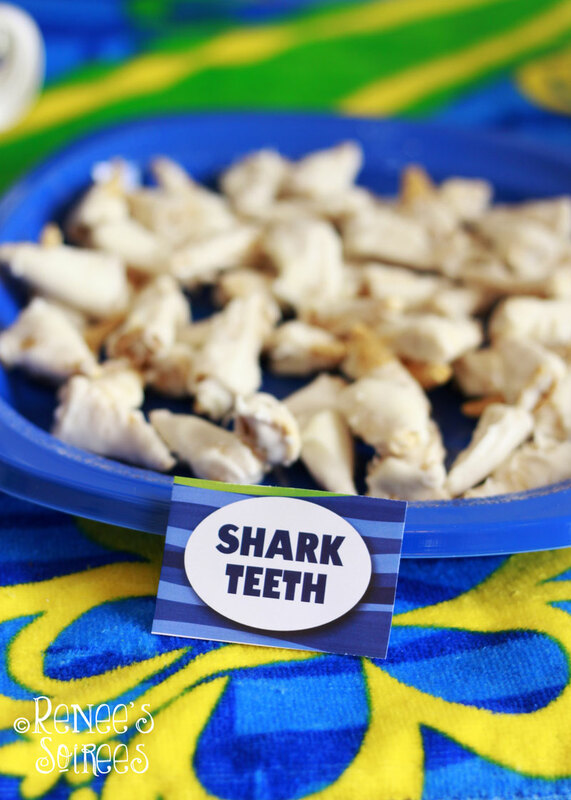 These Shark-Infested Jell-O cups were a big hit with the kids. 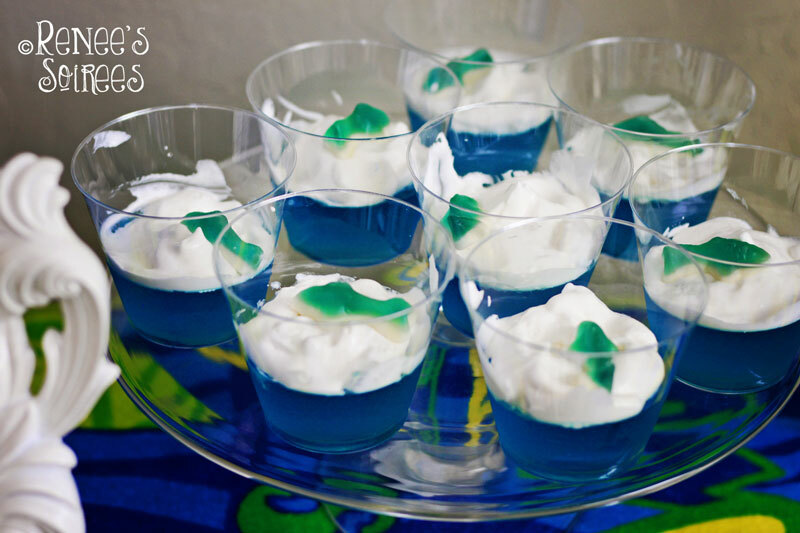 I just filled some clear cups with blue gelatin, and once it had set up, I added Cool Whip and gummy sharks and fishes. 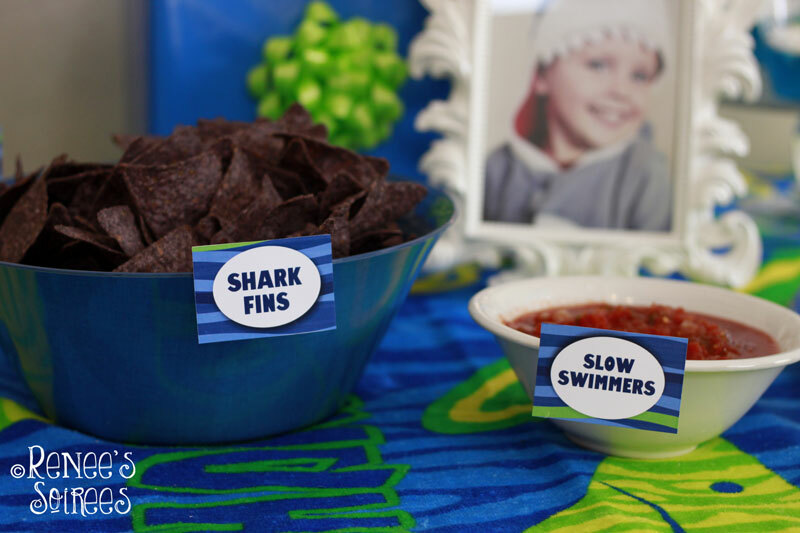 You can find the gummy sharks at candy stores or in the loose bins at Sprouts. I also made some of the shark-infested Jell-O in a trifle bowl. 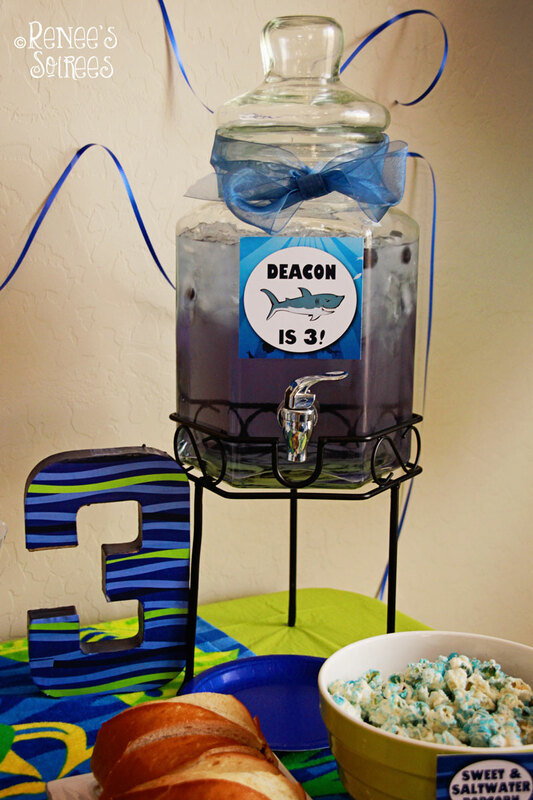 I filled the apothecary jars with blue mint M&Ms, gummy sharks, and Hershey’s Kisses that had blue wrappers. The label on this basket is a 4-in medallion and the medallions are included with the Shark Collection. 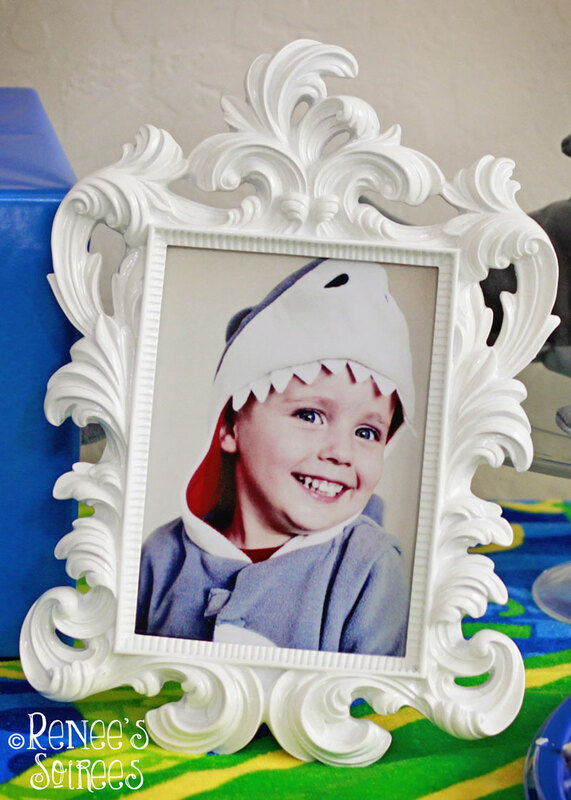 I took a photo of the birthday boy in his shark Halloween costume, and added it to the table. I liked how this Hobby Lobby frame resembled ocean waves, or sea foam. 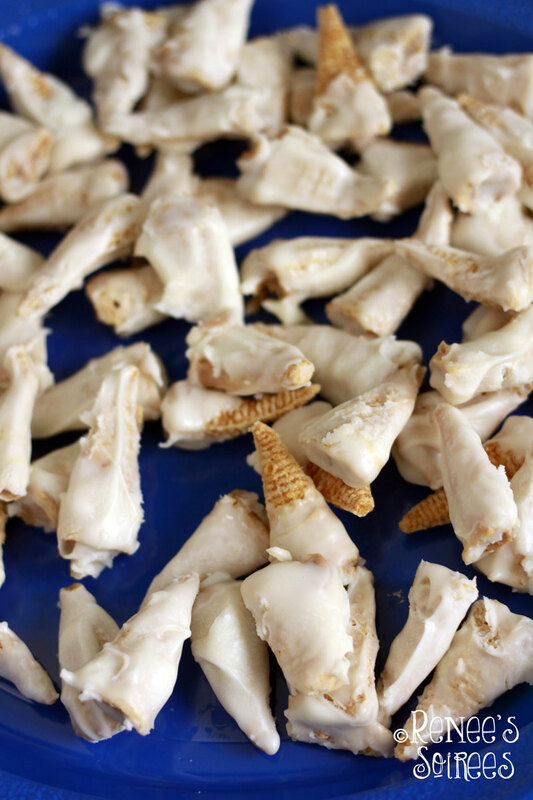 These ‘Shark Teeth’ were also popular, especially with those who like salty + sweet snacks. They are just Bugels snacks, dipped in melted white chocolate / white candy melts. Here is a close-up. I thought blue popcorn might be a fun addition. 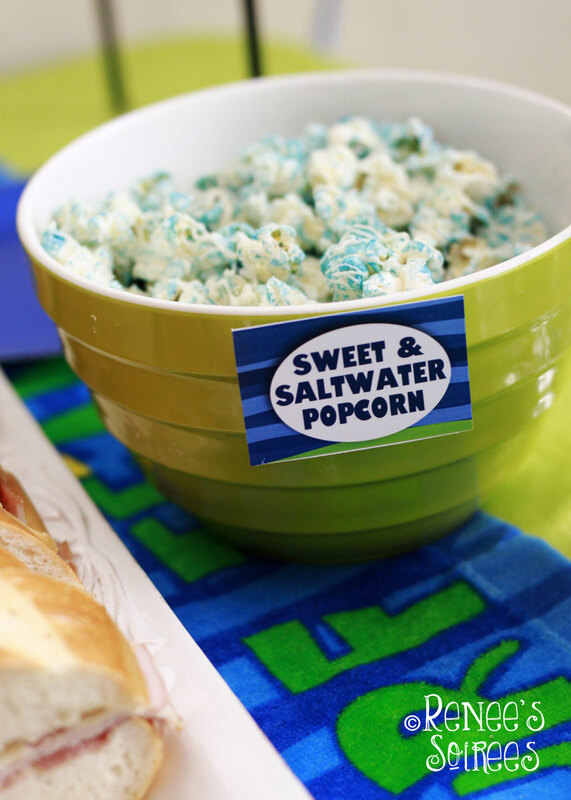 You can make lots of popcorn colors by following these instructions. This beverage container was just water with a few squirts of blueberry lemonade Mio, and some fresh blueberries. 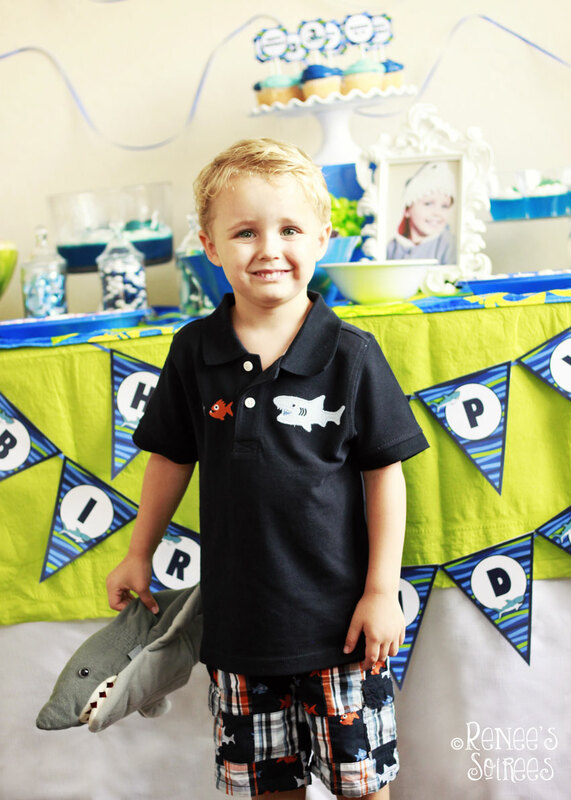 The medallion on the front is one of the personalized items included in the Shark collection. I made the “3” with a cardboard number from Hobby Lobby, and I put Mod Podge on it to glue on the matching paper included with the collection. Here are the included water wraps. 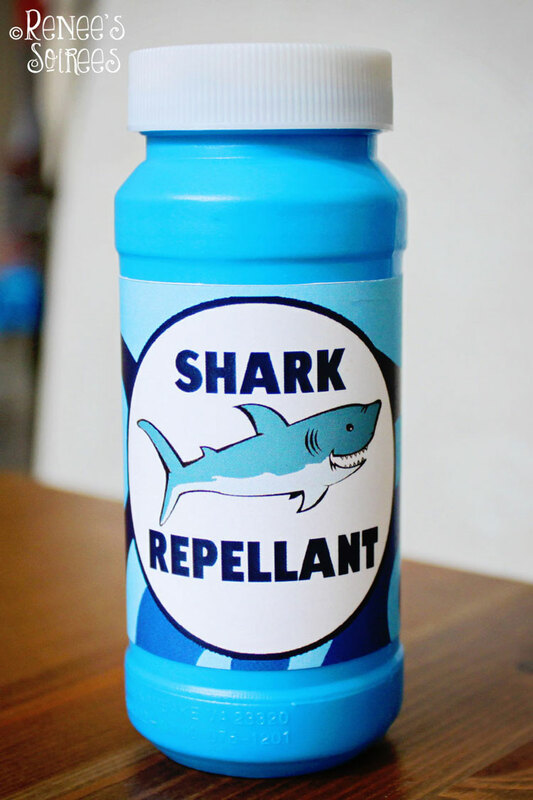 Like everything else, they can be purchased separately, or within the Shark collection. And the cupcake toppers, which I punched out with a flourish square puncher. 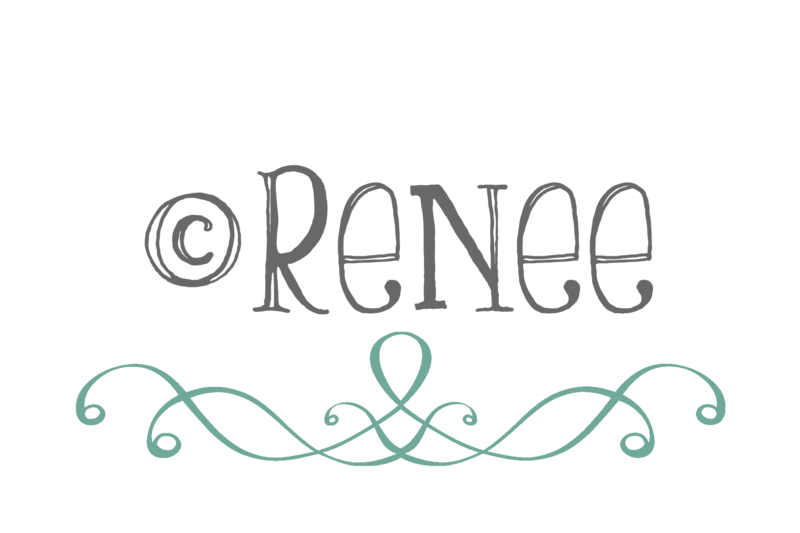 I personalize them free with name and age when you purchase the printables. 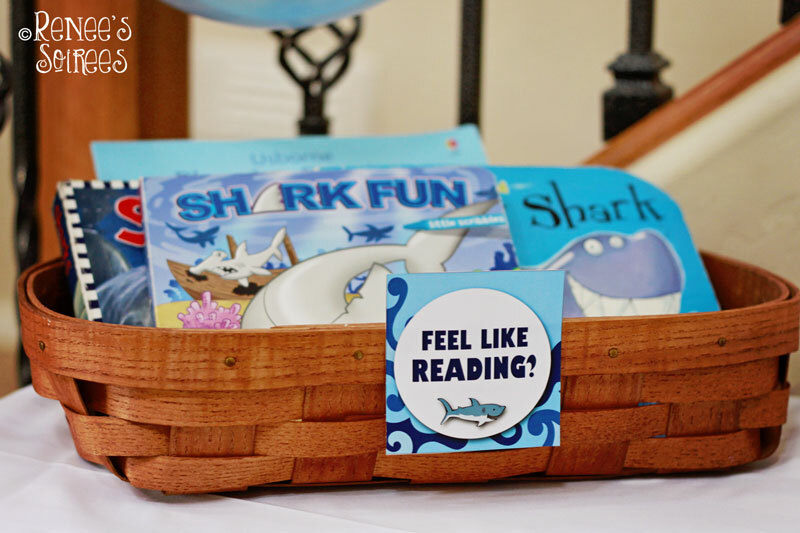 Because my son already has a large collection of shark books, I put them out for guests to read or look at, as an indoor activity. I was surprised at how much activity this station received. 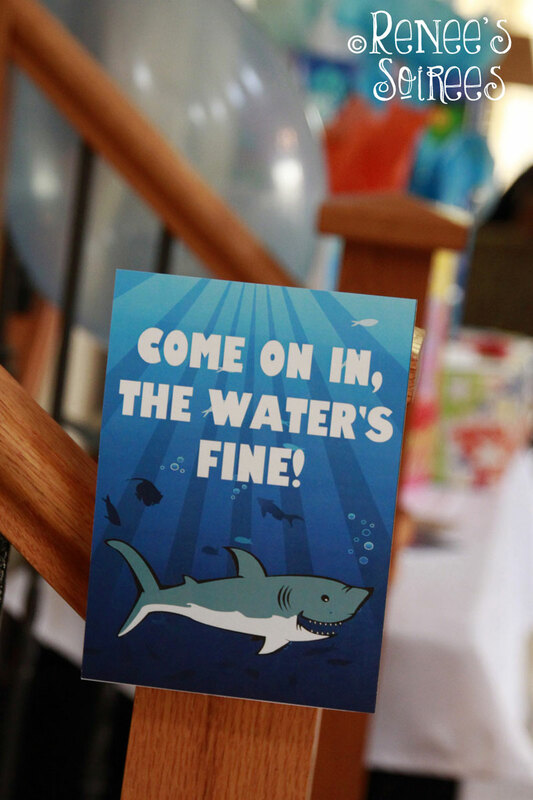 We also set up a place for photo op’s, and let guests take pictures of themselves, or shots with the birthday boy. 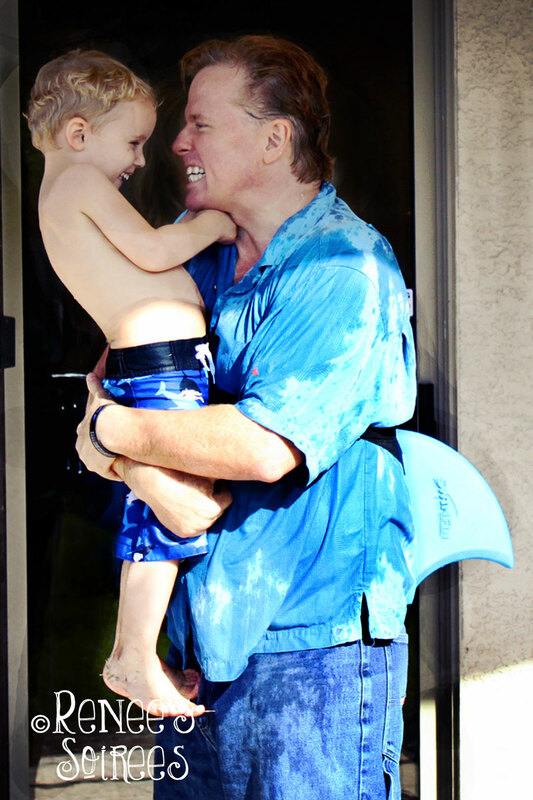 But the MOST fun activity was when Dad put a shark fin on, and the kids got to chase him with water balloons! 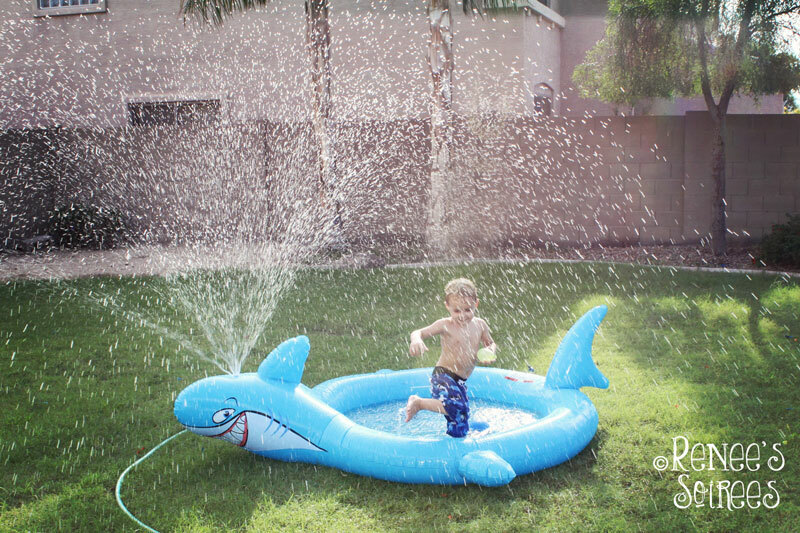 We put the pre-filled water balloons into a shark play pool, and once they were gone, we let the kids splash around in it. 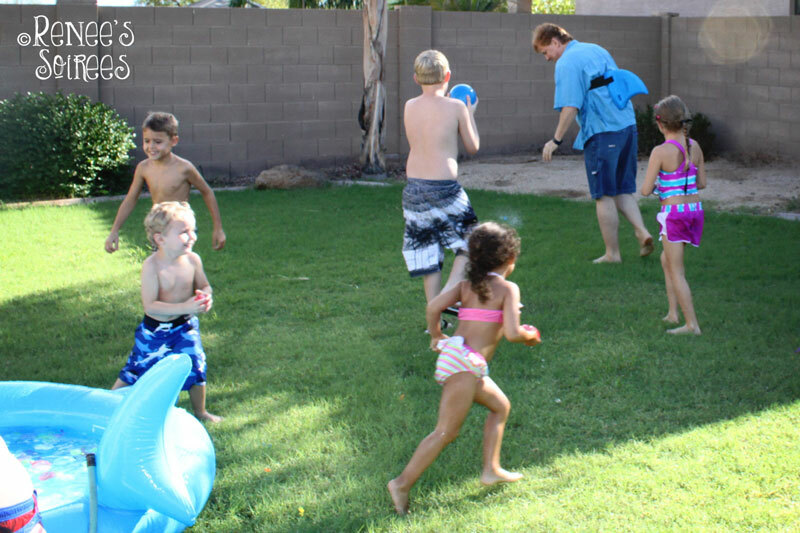 Since most of the guests were preschoolers, this was the perfect activity for a hot summer day. 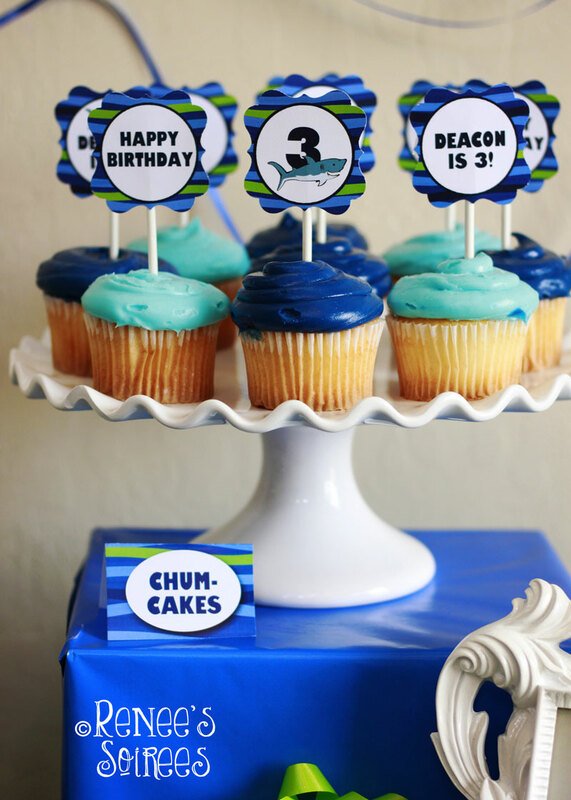 And here are the favors! I love adding custom bubble wrappers to dollar store bubble bottles. 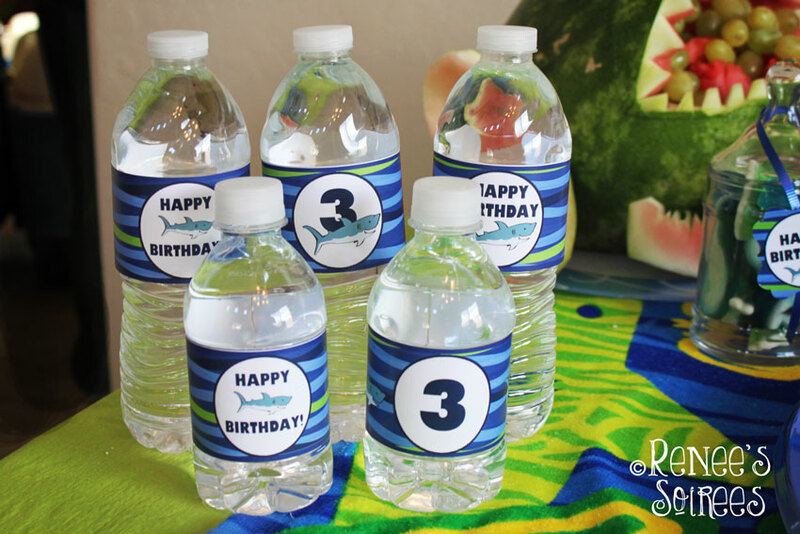 A fun and inexpensive favor! I think the birthday boy had a great time! And he thought I was taking a still photo, which is why he said ‘cheese’. LOL! And yes that’s me snorting! Because kids are That. Funny. 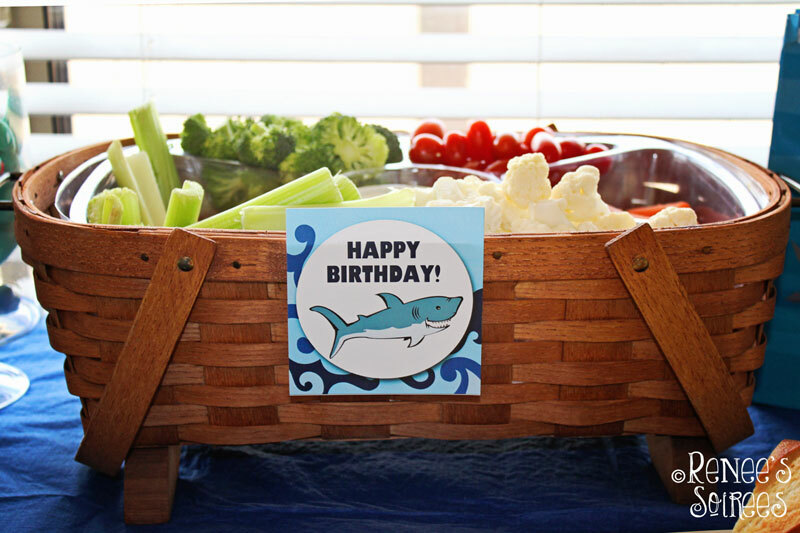 I hope you enjoyed our Shark Party as much as we did! Oh this party is gorgeous!! 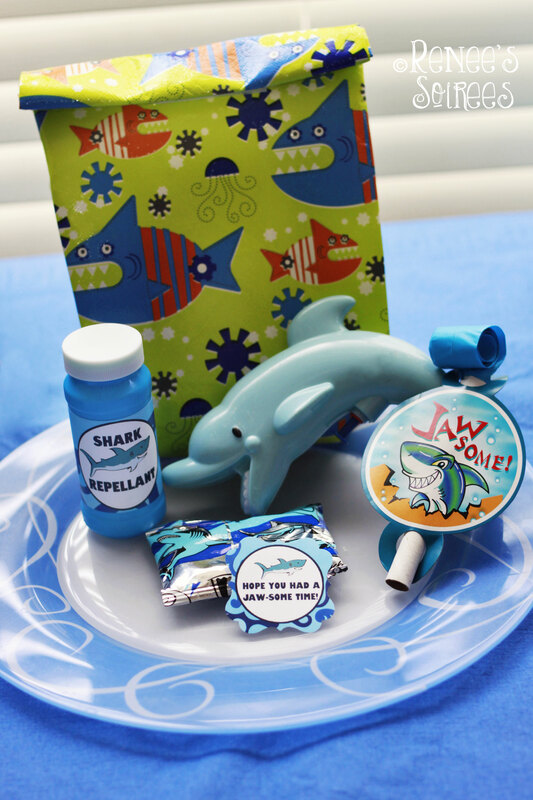 I love those shark infested Jell-O cups…very clever!! 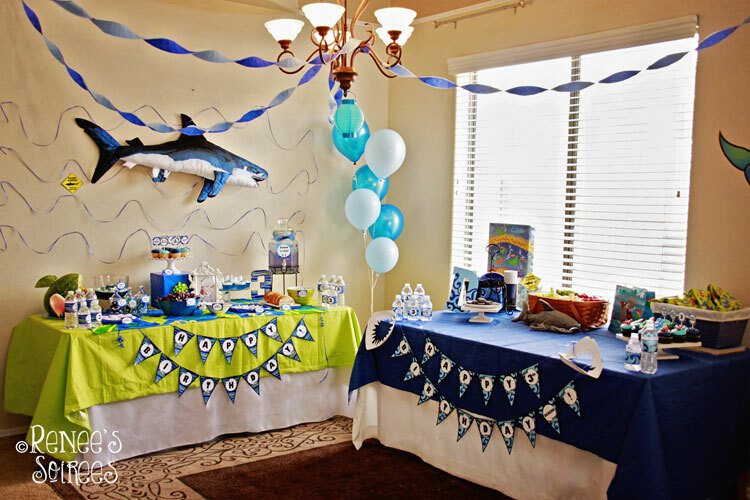 This party was so awesome! 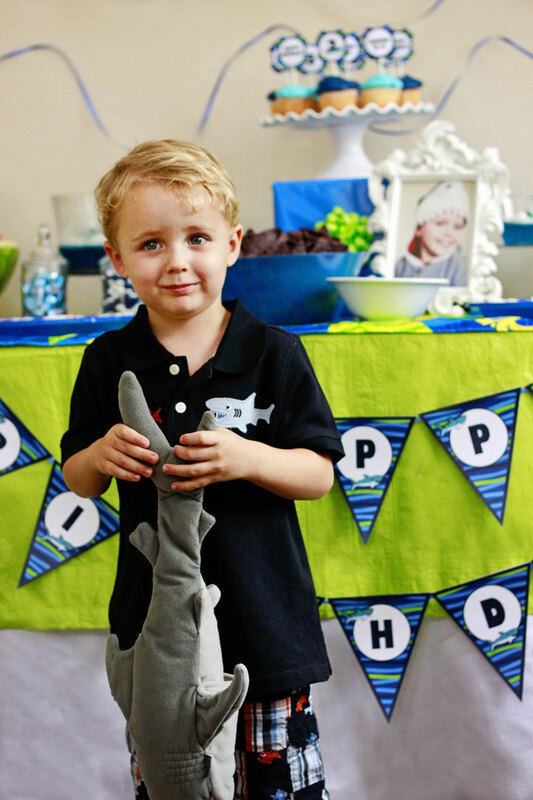 My oldest is semi-obsessed with sharks so I am definitely pinning this for later! 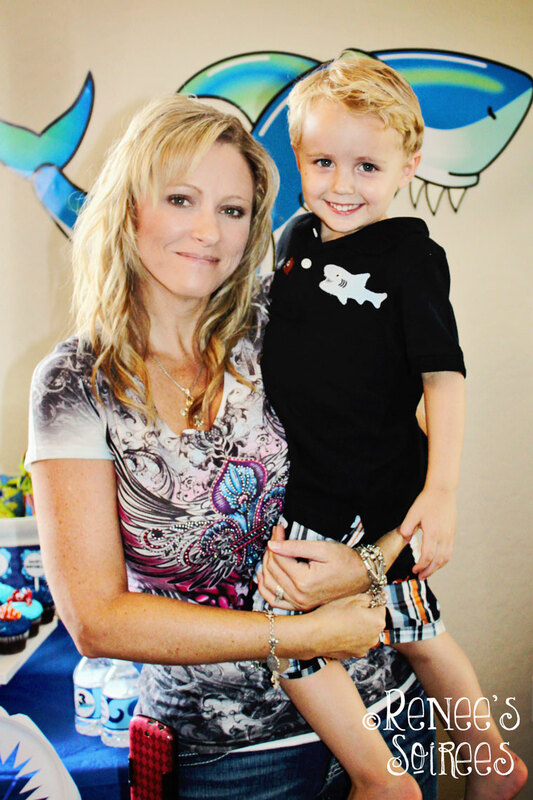 Looks like an amazing party Renee! 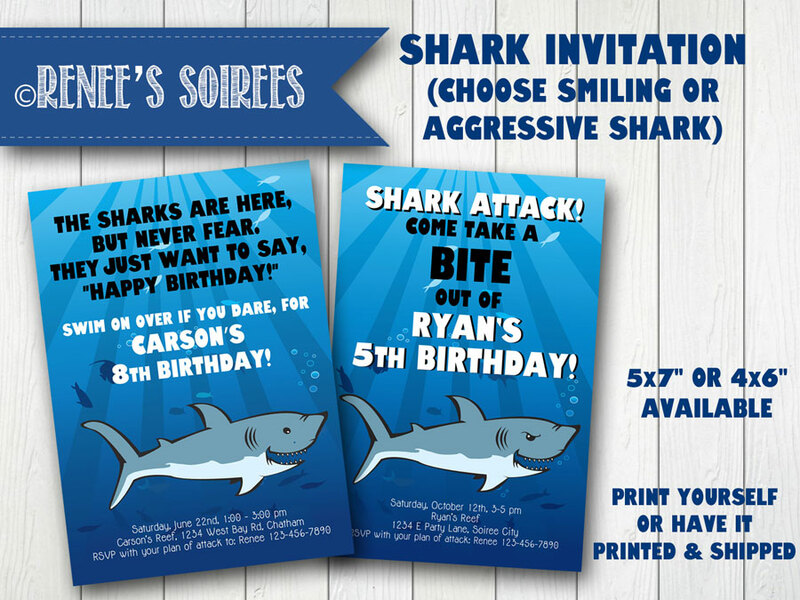 with so many fabulous sharky ideas! LOVE that watermelon!! What an awesome party! You thought of everything! I popped over from A Bowl Full of Lemons…thanks for sharing! Thanks, Abby! My son is STILL talking about it! What an adorable party! 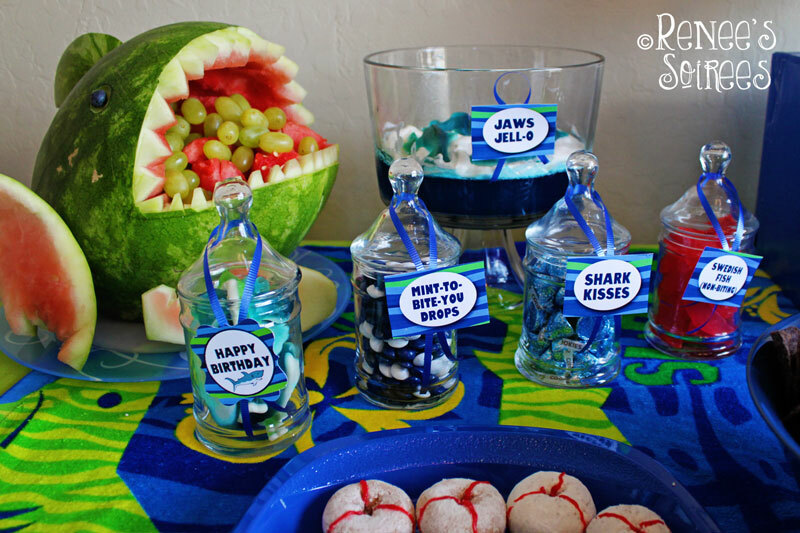 I especially love the watermelon shark. Thanks Heather! 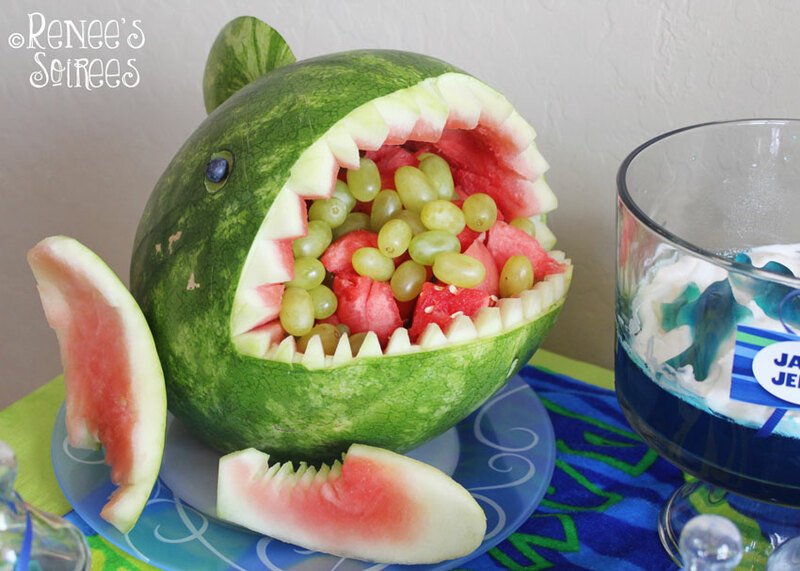 I loved the watermelon shark, too. So rare to have a fun treat that is also healthy! and select ‘shark’ from the drop-down menu. 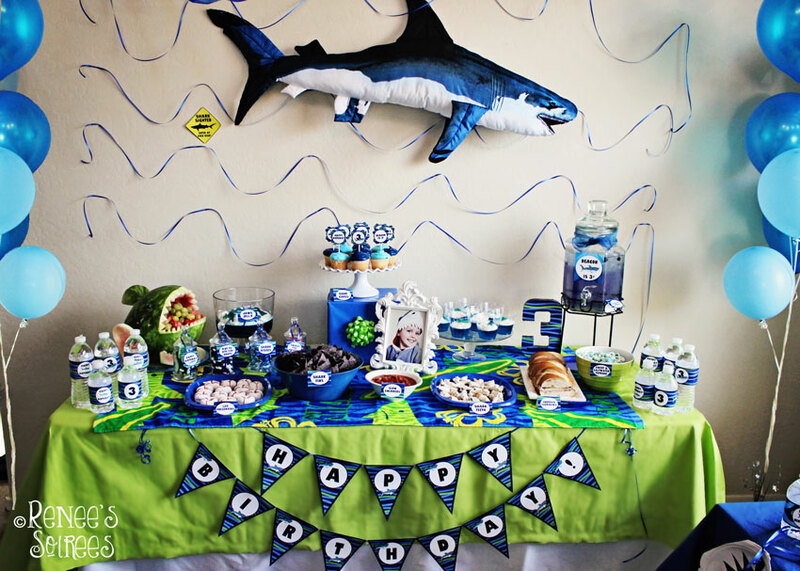 Just tell me the child’s age and you’ll get shark wraps with his age on it. I used white Candy Melts, which can be found in little bags at craft stores or at Walmart in the party section. I melt part of the bag in a measuring cup in the microwave on 50% power for a minute or so at a time, and stir in a splash of vegetable oil to keep it from setting up too quickly.